This article, as it originally appeared in the New Haven Independent on October 17, 2014, can be viewed here. Second in a series exploring where the Greater New Haven Region is now, how it got to where it is, and how it can imagine itself in the future; covering the economic, spatial and administrative history of the region. Without a better understanding of what the Greater New Haven Region actually is, many of the region’s afflictions, as explored in the first installment, including young-adult population loss, rising suburban poverty and divestment in low-income neighborhoods, will continue to elude effective responses. Therefore, it becomes necessary to look back at how it is that we got here, which will then allow us to determine where the region is headed and how best to guide its course. For the purposes of this article, “urban” refers to the pedestrian-oriented development pattern where daily needs are within walking distance of one another; “suburban” refers to the transit-aided development pattern where some daily needs are within walking distance of one’s home while others are accessed by a short transit ride; and “exurban” refers to the automobile-oriented development pattern where daily needs are disaggregated across multiple centers and accessed by highway. Millennia prior to European arrival to the area, explorers crossed the Bering Strait and migrated south and east across the North American Continent. 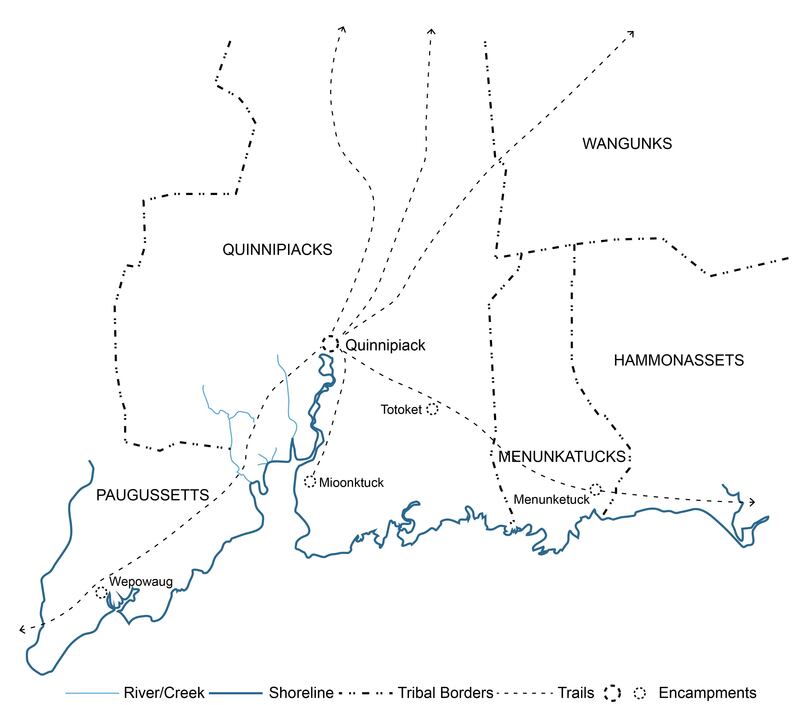 By the sixteenth and seventeenth centuries, a number of Indian tribes had settled in what would become the Greater New Haven Region, including the Paugussett encampment of Wepowaug in Milford, Menunkatuck in Guilford, Hammonasset in Madison and to the west, and the Quinnipiack Indians in the middle. The Quinnipiacks did not have permanent settlements, instead they migrated seasonally between temporary encampments along the fertile shoreline and the protected inland woods. Their environmental impact was minimal and some of the only physical remnants of the indigenous inhabitation of New Haven are found in piles of oyster shells along the eastern shore of the Quinnipiac River. Persecuted in their homeland of England, many Puritans settled in the New World in the 17th century in search of greater religious freedom. However, perceiving the Massachusetts Bay Colony as too liberal, the Reverend John Davenport pursued forming his own colony. With the help of Theophilus Eaton, a merchant looking to invest in a center for trade, Davenport was able to form the New Haven Colony. The site was chosen based on 1) its natural harbor, perfectly situated for the port of a major trade center; 2) the red cliffs of East Rock overlooking a plain surrounded by wilderness, which resembled the Biblical landscape where God instructed the Israelites to build their settlement from the fiery Mount Sinai; and 3) the land being sparsely inhabited as a result of European epidemics that reduced the native population substantially. The Puritan settlers and mercantile investors “purchased” this ideal land from the existing native tribes to create the New Haven Colony and its towns of New Haven, Milford, and Guilford. In the main settlement of New Haven, a grid of eight streets formed nine perfectly square blocks in accordance with the design of Israelite cities from the Bible, including the central square left open as communal space. Nestled between two small creeks at the mouth of the harbor, this Nine-Square Plan makes New Haven the first planned city in America. Success, however, did not come immediately for the colony. Aside from displacing the remaining Quinnipiacks and relegating them to a reserve on the eastern side of the Quinnipiac River, the port failed to take off, resulting in many of the colony’s investors leaving. By 1665, the New Haven Colony was absorbed by the much larger Connecticut Colony. In the wake of its merging with the Connecticut Colony, New Haven became an agrarian village for sustenance farming surrounded by a scattering of hamlets in Milford, Guilford, and the Town of Branford (formed in 1685). While a loose network of paths did physically connect these places to one another, roads and land transport were secondary to maritime travel during this time. As a result, Greater New Haven remained trapped in the wilderness – disconnected from the wider world and to each other. New Haven’s port rebounded in the second half of the eighteenth century, joining the rest of New England’s maritime centers with increased trade activity. By the turn of the century, New Haven’s Nine-Squares were no longer practical for the growing mercantile village and were bisected by the new streets of High, Wall, Orange, Temple, and Crown. However, even this massive increase in street frontage could not contain the growing spatial needs of the village. The renewed port pushed development east of the Nine Squares along the East Creek and Water Street – forming a new community named the Newtownship. In 1784, the City of New Haven was incorporated and became co-capital of Connecticut along with Hartford. The Town of New Haven still existed at this time and included the City of New Haven and the separate Towns of Westville and Fair Haven. The Towns of East Haven, North Haven, Hamden, Woodbridge, and Orange were also created in order to serve new church congregations and provide more space for larger farms. In 1815, the Borough of Guilford became a distinct entity within its town so that services could be provided for the center without taxing the rest of the predominantly agrarian town. Still sparsely supplied with roads, towns within the Greater New Haven Region remained isolated from one another, reinforcing their autonomy. The War of 1812 slowed New Haven’s port activity to a trickle, but by 1825 construction had begun on a canal that would bypass Hartford and the Connecticut River to eventually link New Haven’s harbor to Northampton, Massachusetts. As a result, speculative building expanded New Haven’s footprint on all sides. To the east, the Newtownship grew inland away from the shore and its maritime roots. To the north, Orange Street became a canal quarter of small shops and houses. To the west, a village grew around small factories at Howe and Chapel. To the south, a poor quarter of the city known for the tanning industry saw development begin on a miniature nine-square plan known today as Trowbridge Square. Outside of town to the west, the small hamlet of Westville grew into a village with water-powered mills along the banks of the West River. On the other side of New Haven, the Town of Fair Haven grew a village of its own around shipbuilding and oystering. Like Fair Haven, Milford was a seafaring village, in addition to having an agricultural base. Most other settlements in the region were hamlets or small villages organized around a town green and church with farms on the periphery. Joining the region during this time are the Towns of Bethany, Madison, and North Branford. Despite the active port, new canal and recent growth, New Haven remained a predominantly artisan and trade economy. The valley region around Shelton, Derby, and Ansonia were a larger industrial force than New Haven due to their superior access to water power. New Haven’s Mill and Quinnipiac Rivers moved too slowly to efficiently power mills. The rural hinterlands also produced more raw material than the City, making New Haven just one small part of the overall region. Connecticut’s first railroad was built in New Haven along the west bank of the Mill River, helping to make the Newtownship the manufacturing center of the city. The Farmington Canal was soon replaced by the Northampton Rail Road and rails were laid to Hartford, New York, and the shoreline. Due to the infrequent stops of rail infrastructure, railroads had a centering effect on development in Greater New Haven. As a result, antebellum growth in the city took New Haven to its pedestrian limits. The Nine Squares grew denser and began to resemble a downtown with concentrated business activity, buildings without setbacks, and increased height. Satellite villages continued to growth on all sides of the Nine Squares and form their own distinct communities with a mixture of housing, institutions, shops, and factories. Westville and Fair Haven grew into full-fledged villages with substantial economies of their own. A growing West Haven prompted the creation of a borough district within the Town of Orange. Stops along the railroads in towns like Branford and Hamden developed as business sites for manufacturing and quarrying. While much of the region remained as a series of spatially isolated agrarian villages, the railroad helped New Haven become the dominant economic force in the region. The first horse-drawn streetcar was built in 1861 to connect Fair Haven and Westville through Downtown New Haven. The streetcar lines became a catalyst for development as suburban neighborhoods grew up along its routes. Blatchley Avenue was one of the early streetcar suburbs to be subdivided and was quickly followed by Edgewood, Whitney-Orange, and lower Howard Avenue. Unlike the pedestrian-oriented satellite villages of yore, these transit-oriented neighborhoods were overwhelmingly residential and dependent on Downtown for work, cultural amenities, and shopping. While the city expanded on all sides, the older sections of the city simultaneously grew denser. The Nine Squares saw the construction of sky scrapers, and undeveloped lots in the satellite villages welcomed row houses and apartment buildings. Immigrants from Eastern and Southern Europe supplied the city with a labor force for its factories and settled in older neighborhoods creating ethnic enclaves. 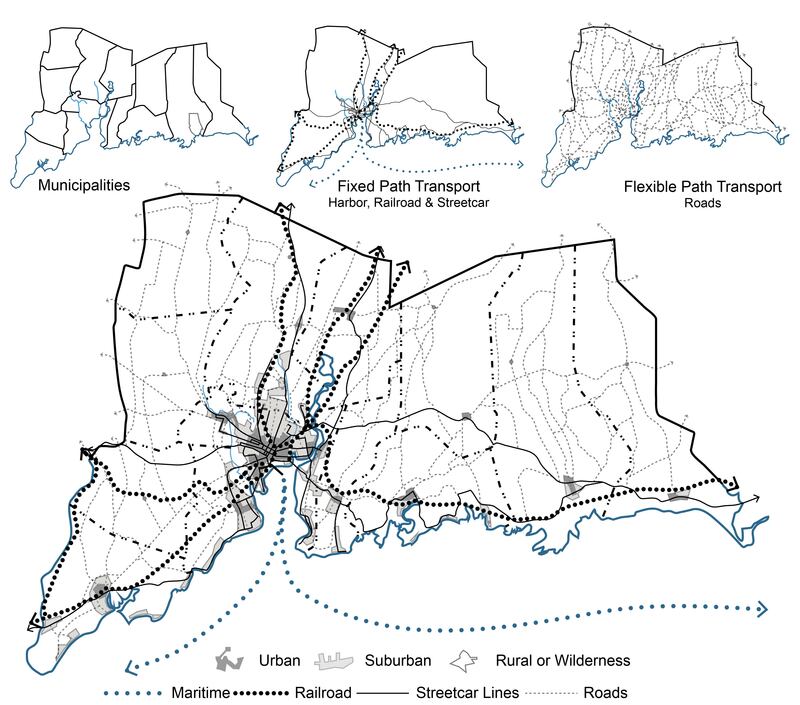 The centering effect of the railroad in combination with the streetcar’s ability to extend the city fabric, created a large continuous city stretching beyond the municipal boundaries of New Haven. Not surprisingly, in 1874, the Town of Fair Haven joined with the City of New Haven; followed in 1881 by the annexation of the east shore of the Quinnipiac River from East Haven by the City, which preceded a consolidation of Town and City government (the Annex remained a separate entity within the City until 1959 and it was not until 1921 that Westville began paying City taxes). Immigration from abroad, migration from New Haven’s surrounding rural towns as agriculture moved to the Midwest, and the advantages of coal and rail over water power and cargo shipping caused the city’s population and economy to explode. This era marks the peak of New Haven’s dominance in the region with the majority of Greater New Haven’s population both living and working within the municipal boundaries of the City. While close to 80% of the region’s population lived within New Haven’s borders in 1920, the majority of new residential construction occurring after this point happened in neighboring Hamden, West Haven, East Haven, and along the shoreline. After the passage of the Emergency Immigration Act of 1921, the City’s older neighborhoods increasingly became home to migrants from the American South instead of immigrants from Europe. These dense working class neighborhoods offered rental housing, convenient commutes to work, and a sense of community. Unfortunately, they also provided a low standard of living characterized by cramped living space, unsanitary streets, and air pollution. The streetcar suburbs of the previous era also grew denser and more diverse in both demographics and land use. Second and third generation immigrant families found more space and a higher standard of living in these neighborhoods, while new auto-oriented suburbs sprang up on the periphery attracting well-off households. Though still accessible by streetcar, these suburban neighborhoods differed from their predecessors in block length, density, land use, lot size and distance from Downtown. Examples of these neighborhoods include Whitneyville, Spring Glen, Allingtown, and Momauguin. From this pattern emerged entire towns of predominantly suburban dormitories dependent on the central city yet separate from it politically. Promoting this new growth were a series of public programs aimed at responding to widespread automobile use, promoting homeownership and addressing the crisis of the Great Depression. In the 1930s, portions of the old Derby Turnpike were designated Route 34 and rebuilt as a divided road and construction of the Wilbur Cross Parkway begun, which served non-commercial automobile use – promoting residential development to the west of New Haven. As part of the New Deal, the Home Owners’ Loan Corporation (HOLC) was created in order to stabilize the housing market and protect home owners from foreclosure. To achieve this, HOLC established offices throughout the country to conduct surveys of residential neighborhoods and grade them for mortgage security purposes. Less expensive mortgages were made available for highly ranked neighborhoods while a lower ranking invariably meant a higher interest payment or complete inability to secure a mortgage at all. The impact of the HOLC grading system was to promote new construction in suburban areas, while degrading existing neighborhoods particularly those in the urban core. By World War 2, New Haven faced a plethora of issues, including grinding traffic congestion in the city core, a rapidly decaying central business and wholesale district, and loss of population. Prior to the construction of the Interstate Highway system, trucking was conducted on the old State Routes that ran directly through the city’s Downtown and with commuters increasingly using automobiles over transit, the center of the city became choked with motor vehicles. The Central Business District was also distressed with obsolete infrastructure and growing competition from suburban sites located outside New Haven’s municipal boundaries. The Housing Act of 1949 provided an opportunity for municipal governments to clear older parts of their cities away to be replaced with modern infrastructure. In New Haven, urban redevelopment was spearheaded by Mayor Richard Lee and his Redevelopment Agency. Federal and State funds were secured for slum clearance and highway construction in Dixwell, the Central Business District, Oak Street, and the Newtownship. Blocks of tenements, shops and factories were demolished and limited-access expressways were built through the center of the city connecting to the interstate highway system. Sites for new construction were also opened up in the middle of the city for commercial blocks, housing developments, and industrial facilities. The effect of these efforts was to displace thousands of residents, increase net population loss in New Haven, provide a convenient exit from New Haven to surrounding towns via highway, and replace a seamless urban fabric with barriers and pods of single-use development. New Haven essentially destroyed itself in order to rebuild as a disaggregated series of housing blocks, office towers, and industrial parks in the model of exurban development. 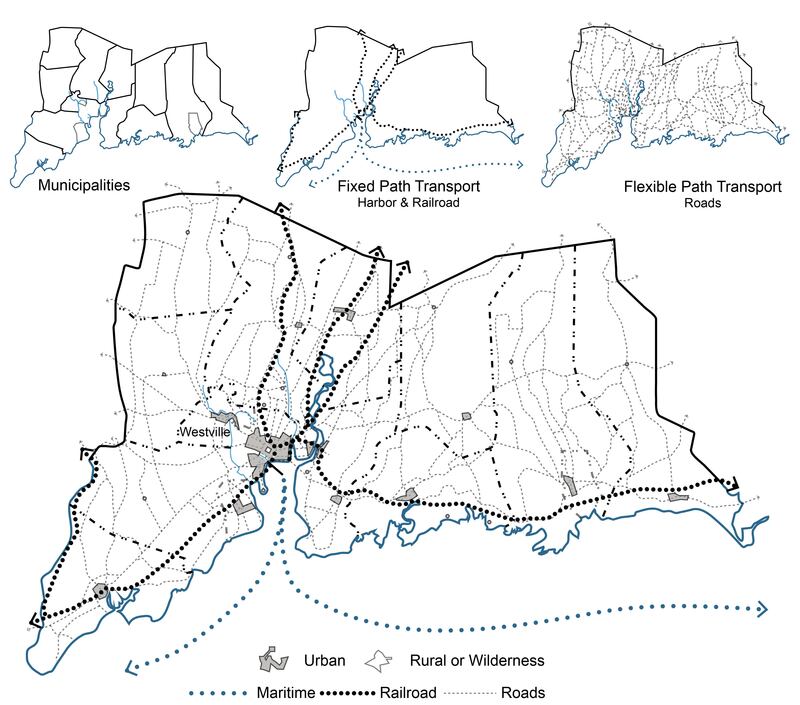 The construction of highways irreparably changed the Greater New Haven Region after 1970; growth was no longer centralized around the Downtown, but instead oriented towards the network of limited access roadways that crisscrossed the region. Regional facilities could take advantage of easy highway access in exurban locations, corporate headquarters could locate building campuses on inexpensive former farmland in office parks, and shoppers could find free parking at malls. Most of the functions of the city previously provided in the Downtown were now scattered across the hinterlands and accessible only by car or an arduous transfer-laden bus trip. Urban Redevelopment in New Haven did little to stem the tide of exurban growth and may have actually accelerated it. The city declined rapidly in this period as crime increased, the population plummeted, and industry and business closed up shop or left the city. Funding from the Federal Government also dried up and the city was unable to generate enough tax revenue to sustain itself. In the early 1980s, the Payment in Lieu of Taxes (PILOT) program passed the State legislature, which compensates municipalities for some of the tax revenue lost from non-profit organizations. By 1995, the City had nearly 800 vacant buildings and a dwindling population of a mere 122,000 – down from a height of 160,000 just a half century earlier. Taxes in the City fell disproportionately on residential property due to the large number of tax-exempt non-profits, and the exodus of business and industry. Despite paying nearly 60.00 mills in taxes for much of the early 90s, services were cut and budget problems continued. To make matters worse, between 1989 and 1991, there were 99 homicides in New Haven as drug gangs operated with near impunity in some of the City’s neighborhoods. To address many of the problems that came along with de-industrialization in the region and the development pattern of the post-War period that favored exurban sites, the City demolished hundreds of vacant buildings through the Livable City Initiative (LCI), embarked on a massive multi-billion-dollar school rebuilding and reform effort, worked with State and Federal Law Enforcement to dismantle neighborhood drug gangs while instituting community policing, and worked closely with Yale University to have a greater stake in the future of New Haven. Building demolition has left many neighborhoods with large gaps in street frontage, which is slowly being filled in with community gardens, driveways, occasional new construction and Yale Building Project houses. Crime has dropped dramatically from its heights in the early 90s but certain neighborhoods are still plagued by chronic violence. The Citywide School Reconstruction Program has rebuilt nearly every school in the city, taking buildings that had been in a state of disrepair to like-new. This program, however, has come at a higher cost than was necessary with several projects being audited by the State for going over budget and poor planning negatively impacting several neighborhoods. Public school performance in the City has remained consistent with expectations based on New Haven’s demographics – overall results fall below the State average, but vary based on neighborhood. Students from households that get support outside of school tend to perform better than children from households that aren’t supportive. The fact that New Haven happens to house a disproportionate number of those latter households is why performance is lacking. A formerly apathetic force in the City, Yale University has taken a larger role in guiding New Haven’s development in the last two decades. As the largest property owner in the City, the University has transformed Chapel Street and Broadway by attracting chain retailers mixed with small boutique stores to serve the Yale community and regional shoppers. Similar streetscape and façade improvements, however, may have been possible through the creation of a Special Services District rather than effectively turning those commercial districts into hybrid urban-outdoor malls. The Yale Homebuyer program has helped transition the Winfield (Winchester-Mansfield) section of the Dixwell neighborhood, the Goatville section of Upper State Street, and the Dwight neighborhood from blighted to invested in. The former Winchester Repeating Arms Company campus has been reborn as Science Park in order to incubate start-up companies in the City. For the first time in decades, the population of the City has increased as Yale University and Yale-New Haven Hospital along with its associated biomedical industry have grown and the rental market has boomed, attracting young people to New Haven with cultural amenities, nightlife, and dynamic neighborhoods. 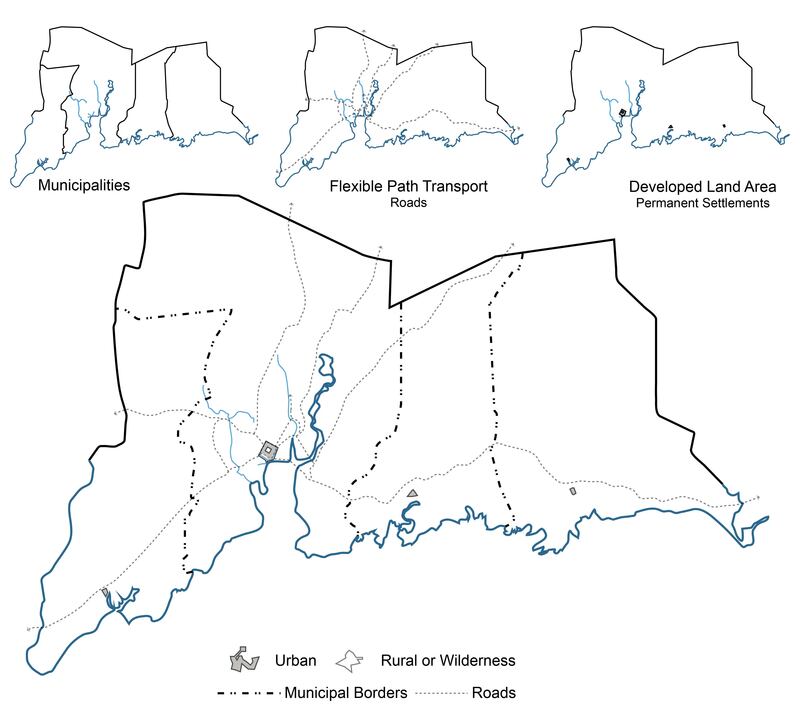 Greater New Haven has been many things throughout its history: seasonally settled land by native tribes; a series of autonomous self-contained villages; a regionally-dominating industrial city made up of a Downtown, neighborhoods, and suburbs all connected by transit; and a dispersed codependent city-region that includes highway-oriented edge cities and exurban residential communities. In the pre-industrial era, walking distance determined the size limits of villages and towns, which is why we see New Haven develop satellite villages around the Nine Squares in the mid-nineteenth century. During New Haven’s industrial rise in the 1880s, transit in the form of streetcars became a catalyst for development – extending the City’s fabric beyond a pedestrian’s limit. By the 1920s, the automobile had become the primary conduit for growth. Though still accessible by streetcar, this auto-oriented development pattern produced traffic congestion in the Downtown, which had been built around transit use. 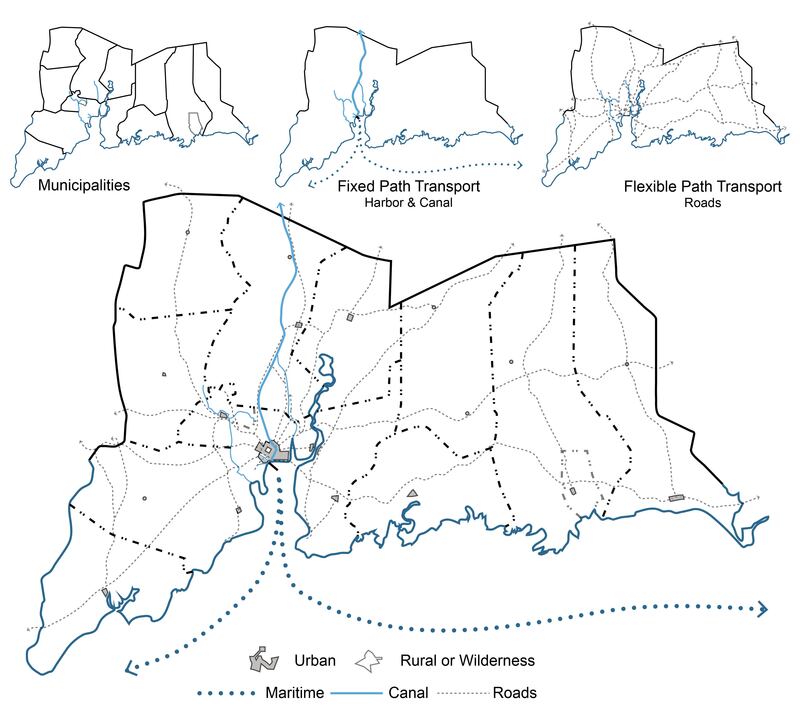 The arrival of parkways and highways encouraged the dispersion of residential, business, and commercial activity from the urban core to the hinterlands – creating a region of multiple centers. In 1941, streetcar routes aligned with developed land area; virtually the entire city was accessible by transit. However, by 2014 much of the region’s developed land area has become inaccessible by bus despite expanded service. 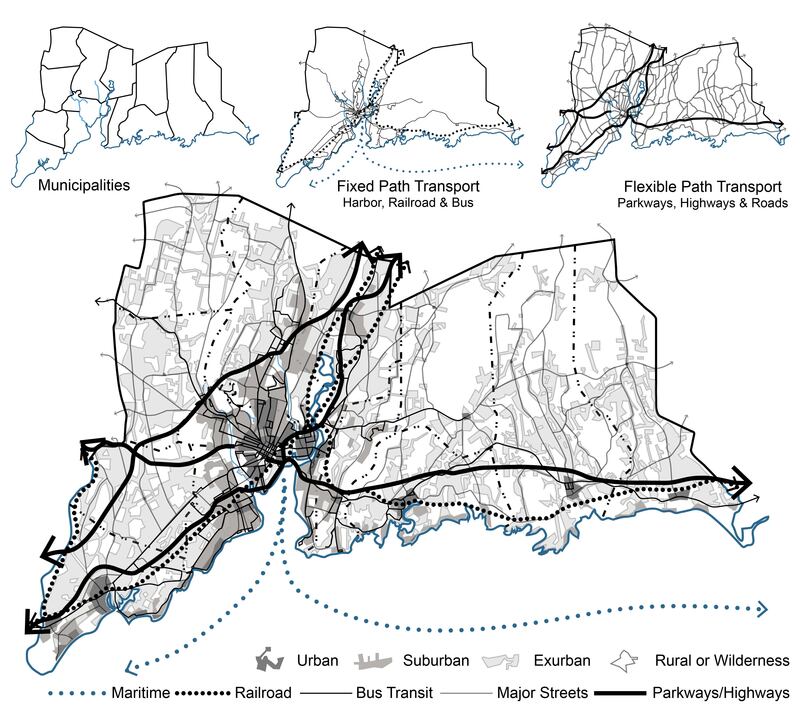 This can be attributed to the disconnected street layouts and low density development of exurban areas. Furthermore, what was once a convenient commuting tool from suburban neighborhood to downtown by streetcar has become a traffic-filled trek across the region from neighborhood to downtown to edge city for many bus riders. The formation of new towns in Greater New Haven resulted from the desire of church congregations to each have their own municipality. Today’s town boundaries correlate with colonial-era church districts, not economic, social, topographic, or geologic factors. 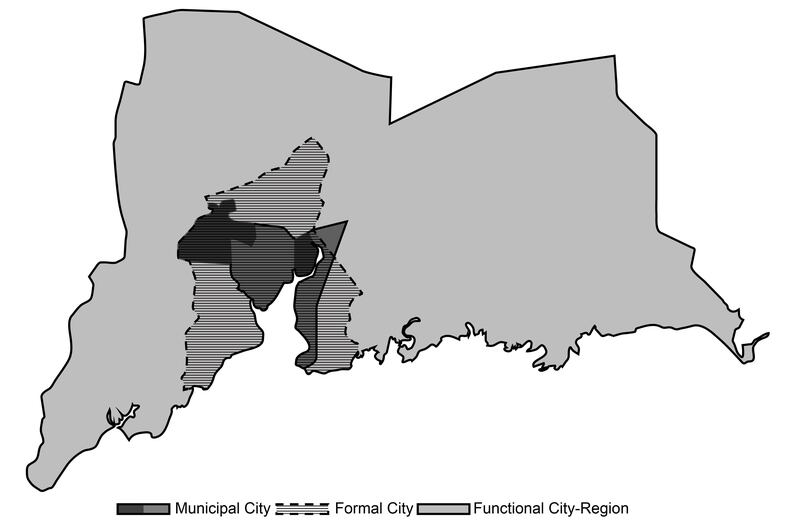 Greater New Haven’s archaic and arbitrary municipal boundaries have made it difficult to meaningfully discuss the region due to misunderstanding the distinction between the municipal City of New Haven, the formal city of New Haven, and the functional city-region of Greater New Haven. 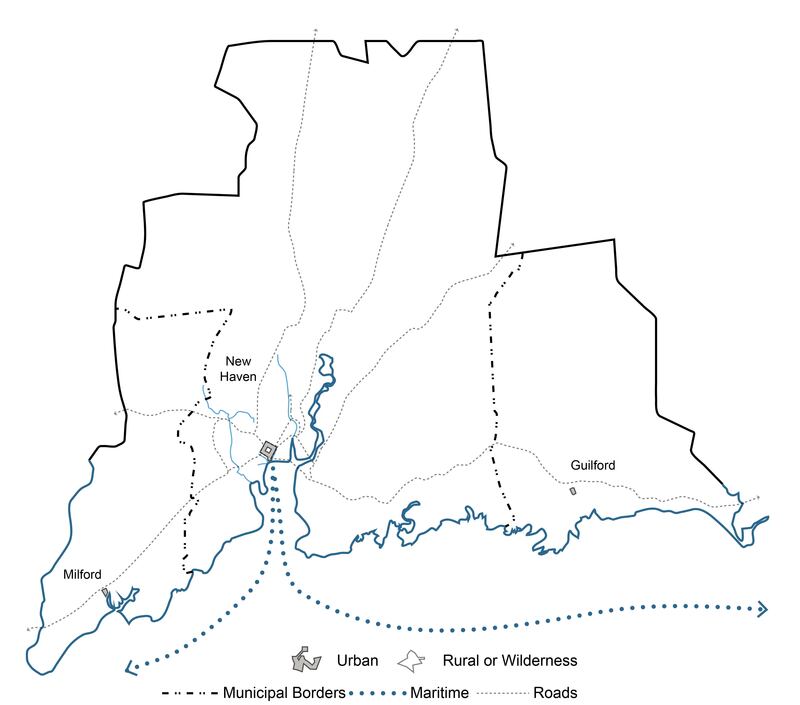 The contemporary municipality of the City of New Haven is the result of the consolidation of four distinct entities: the City of New Haven as incorporated in 1784, the Town of Westville, the Town of Fair Haven, and the annexed section of East Haven that runs along the east shore of the Quinnipiac River. The formal city of New Haven corresponds with the monocentric industrial city at its peak in the 1940s, which contained the Downtown and its surrounding transit- and auto-oriented neighborhoods that extended into Hamden, East Haven, and West Haven. 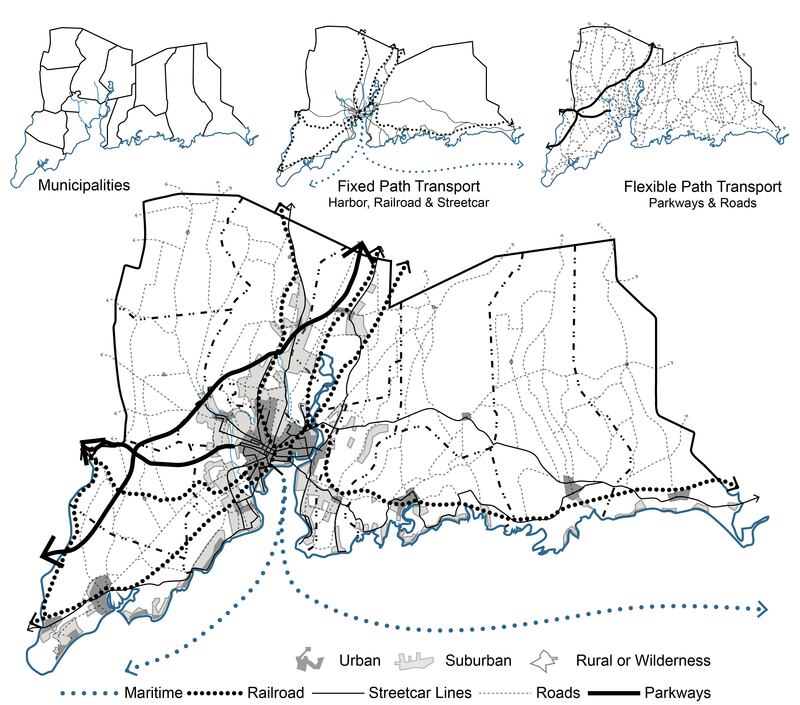 Like the East Shore, these areas probably should have been annexed to the city due to their economic, social, and physical relation to one another. 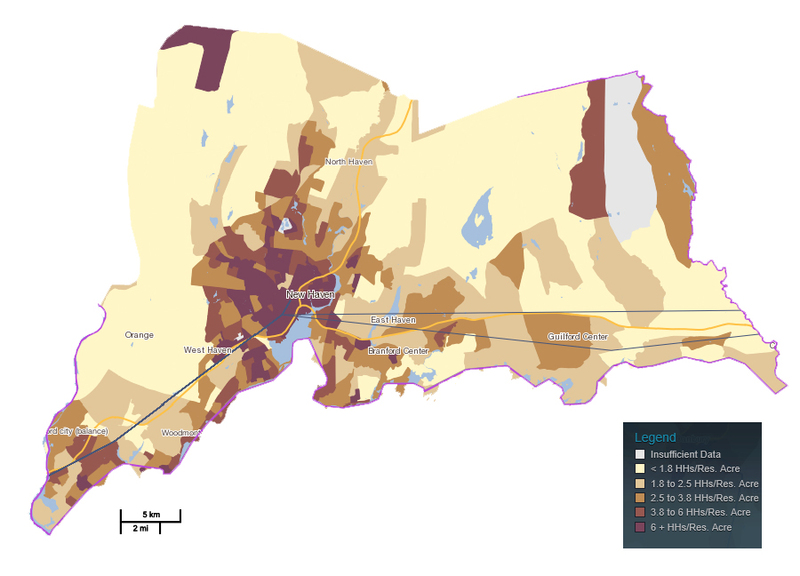 The functional city-region more or less aligns with Greater New Haven, encompassing the formal city and the new exurban residential and edge city developments around highways. This highway-oriented growth is both tied to and separate from the formal city. Downtown has become one center out of many for employment, shopping, and culture in the region. However, New Haven remains the regional service provider for the poor, homeless, and other service-requiring populations. Limiting our understanding of “the city” to what happens to fall within the municipal boundaries of the City of New Haven reduces our ability to address issues in Greater New Haven such as youth population loss, rising poverty rates, jobs access, housing affordability, and school performance – each of which transcends our colonial-era town boundaries.